Hello! My name is Daria Solomon, and I will be graduating from Hope College in Holland, Michigan, in December. I have been working toward a double major in mathematics and English for both elementary and secondary education, and I am completing my student teaching semester through the Chicago Semester Program. Since I am working toward certification in both elementary and secondary education, I have to complete my student teaching placement in a middle school setting. 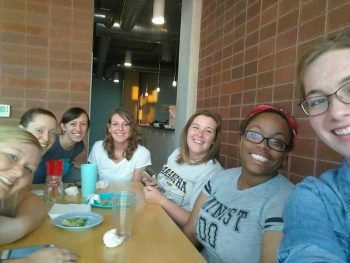 I could have stayed in the west Michigan area for student teaching; however, after discovering the Chicago Semester Program, I couldn’t turn down the opportunity to learn about living and teaching in an urban community so different from the communities in which I have lived and worked before. Four weeks ago, I moved into the La Casa Student Housing in the Pilsen neighborhood of Chicago. La Casa is run by The Resurrection Project, an organization dedicated to empowering the people of communities such as Pilsen, its founding community. One of the primary focuses of The Resurrection Project is to provide safe and affordable housing, such as La Casa, for people in communities like Pilsen. La Casa is a residence hall for students attending a variety of institutions in the Chicago area. The facility also provides different educational and professional development opportunities for its residents in order to better prepare them for life after college. Each apartment unit in the building has five bedrooms surrounding a common kitchen and living space. Although there are currently nine students living in my apartment unit, the suite could house ten students, with two in each bedroom. The apartment has two full bathrooms – one on either side of the kitchen. It can get hectic with so many people sharing living space, but differences in our schedules eliminate most timing issues regarding bathroom and kitchen use. Once each week we all try to get together for a “family dinner.” So far, we’ve made tacos, spaghetti, sloppy joes, and pizza, and each meal has been complete with side dishes and something sweet for dessert. This week, I will be starting my fourth week of student teaching. I am student teaching at Walsh Elementary School with a math teacher in the middle school wing of the building. Throughout the day, I work with three different groups of students: a class split between seventh and eighth grade, a solid seventh grade class, and a solid eighth grade class. In the morning, we have standard math classes, and I work with students in each of the three classes listed above on Algebra I content; however, in the afternoons, I see the seventh/eighth split and the solid eighth class for their intervention periods. During these periods, students have the opportunity to work on and receive extra assistance with math or reading content. Additionally, these periods are used to inform students about the high school application process which must be completed by December 15th this year. Although I had to apply for special programs in high school, we only had three different programs to apply to – these students have dozens of schools and programs to choose from, making the process seem more like the one I went through prior to starting college. While much of my time at the school thus far has been spent familiarizing myself with Chicago Public Schools and, more specifically, with Walsh, I have loved getting to know the other teachers and my students in the middle school. I am grateful for the opportunity to live in the same community as most of my students so that I can better understand their lives outside of school and the ways in which their experiences shape the ideas and perspectives they bring into the classroom. I can’t wait to share more of my teaching tales and Chicago adventures with you over the next three months!